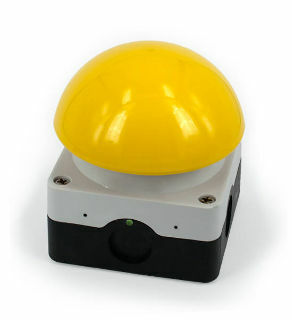 The “Wireless Dome Button” is a palm switch with a large mushroom dome. It is the wireless variant of the “USB Dome Button”. The Wireless Button connects to a workstation or PC via a USB interface, in the form of a “dongle”. A press on the button sends a keystroke (or a mouse button click) to the workstation. You can configure which keystroke that is. You can use the Wireless Dome Button to perform any command on the workstation: launch a presentation, start a show, pause or resume playback, or any other action. The USB interface (dongle) is recognized by the PC as a “keyboard”. Microsoft Windows (and other operating systems) have intrinsic support for USB keyboards. No driver is needed. 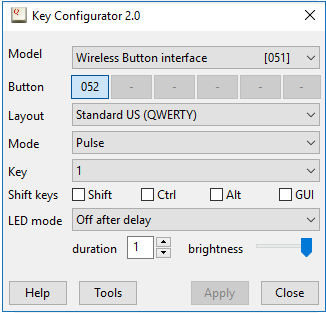 Downloads: Key Configurator utility 2.2. 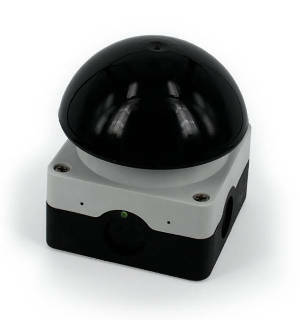 The Wireless Dome Button is a robust and splash-proof “emergency switch”-style button, for indoor and outdoor use. It transmits on the license-free ISM band of 868 MHz (Europe) and 915 MHz (USA, Canada, Australia/New Zealand). Internal protections, like a “debounce” circuit to avoid false triggering, guarantee a reliable operation. As mentioned above, the PC or workstation recognizes the USB interface as a keyboard. 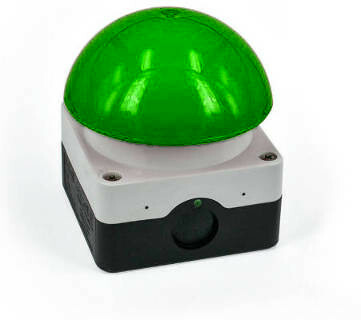 Each connected wireless button is then configured to transmit a key combination (or a key sequence) to the PC. There is a free configuration utility for this purpose, see the Downloads section. In addition to standard keys, that utility also allows you to configure a few extended functions, such as to function as a “play/pause” button on a remote control, or as a mouse button. You can also configure a button to transmit a sequence of key strokes to the PC, including key combinations with “Alt”, “Ctrl” or “GUI” shift modifiers. With a macro, a press on the button can start an application or open a web browser on a specific URL. Up to six Wireless Buttons can be connected to a single dongle, with each button (typically) configured to transmit a different key code. It is possible to connect multiple dongles to a PC, in case more than six buttons must be handled. Power supply (button) Lithium-Ion battery, 3V. Power supply (dongle) Powered through the USB connection. Radio frequency 868 MHz or 915 MHz (depending on model), license-free ISM band. For up to 6 wireless buttons. Wireless Button Interface Specifications (the dongle). Wireless Dome Button Specifications (the button).